Today is National Apple Betty Day so lets celebrate. I know you are loaded with apples from apple picking, so lets use some. And, I KNOW you always have bacon ready to eat - so we'll use that too!! To make the frozen custard, preheat the oven to 350ºF. Lay the bacon on a sheet tray and bake for 15 to 20 minutes until crispy. Drain the bacon on a rack or paper towels and let cool. Chop very finely and set aside. Place the brown sugar, maple syrup, and water in a small saucepan and heat to 250ºF. Remove from the heat and add the chopped bacon. Stir quickly to combine, then pour onto silpat or cookie sheet covered with wax paper. Let cool. (This will take about 20 minutes.) When the mixture has cooled and hardened, break into pieces and store in an airtight container. In a large mixing bowl, whisk together the egg yolks and granulated sugar. Combine the heavy cream, half and half, and bourbon in a small sauce pot and heat over medium heat until just beginning to bubble. Slowly pour the hot cream into the egg yolk mixture, whisking constantly. Return the mixture to the pot and cook over very low heat, stirring constantly until the mixture coats the back of a spoon, about 5 minutes. Immediately remove from the heat and strain through a fine-mesh strainer. Allow the mixture to cool in the refrigerator overnight. Process the custard in an ice cream machine according to manufacturer’s instructions. Mix in the pieces of candied bacon. Store in the freezer until needed. To prepare the Brown Betty, preheat the oven to 325ºF. Mix together 1/4 cup of the sugar, lemon juice, flour, lemon zest, cinnamon, nutmeg, and cloves in a large mixing bowl. Add the apple slices and toss to coat. In a separate bowl, mix together the panko, cheese, melted butter, and remaining sugar. Grease a 9 x 9-inch pan with butter. Make a one-inch-thick layer of apple slices on the bottom of the pan. Sprinkle with the bread crumb mixture. Add another layer of apple slices and top with the remaining bread crumbs. Bake for 45 minutes or until brown and bubbly. 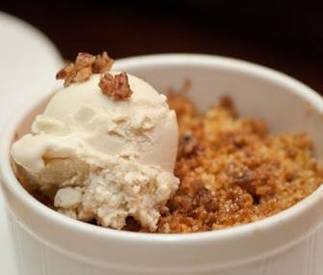 To serve, scoop out individual portions of the Brown Betty and place on serving plates. Top each serving with a scoop of maple–bacon frozen custard.